�����The metals have continued to slip to new lower levels and confidence that this will reverse any time soon has wavered as well. Dealers are feeling the effects of lower prices as the ultimate buyer seems to be hesitating. Granted, most dealers are doing just enough buying and selling to maintain everyday business. The FUN Show, the first major event of 2017, will be a welcome relief for those in need of moving some inventory. This is always a heavily attended show and will certainly give us direction to where the market is headed for the upcoming year. 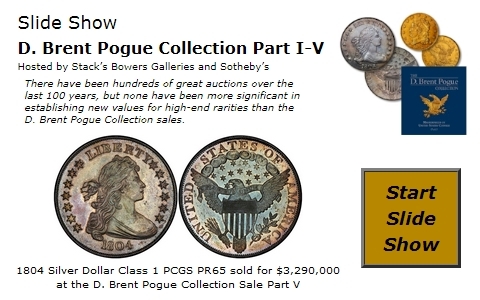 �����Despite the lower prices, dealers are determined to buy and sell rare coins at current levels in hopes of stabilizing the price structure. 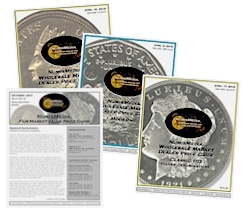 One area that has been active is the Morgan Dollar market; common dates in MS63 through MS66 are steady at current Market prices. However, buyers have been somewhat selective looking for mostly white coins. �����Gold is down around $1,172 and Silver is at $16.72; Platinum was down near the $900 mark last week but has recovered to $934 today. Buyers are uncertain if now is the time to buy or wait for prices to possibly drift even lower. 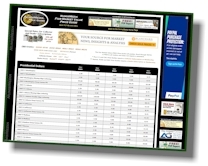 In the latest Moderns Wholesale Market Dealer Price Guide, one ounce $50 Gold Eagles in MS69 are down to $1,205 Market and the PR69 has fallen to $1,415. This is the same level the Proof Gold Eagles trade in the OGP. Proof Silver Eagles are continuing to trade at $49-$50. Bags of 90% Silver are trading at $12,665 among dealers and VG+ Silver Dollars are down slightly to $23,675 per bag of one thousand. �����Too much available inventory is burdening the Washington Quarter market, and this week there is a long list of declines in MS65 to MS67 within the charts. The 1936 S in MS67 is down to $965 Market and the 1939 D in the same grade is lower at $440. There are many other declines down through the 1952 S, especially in MS66 & MS67. The Proof Washington Quarter chart shows less volatility this week with more increases than decreases. The 1938 PR66 is up to $230 Market and the 1956 Cameo PR69 is up to $280. Dealers are looking for Proof issues that have good eye appeal with no hazy surfaces.